Performers include: Billy Bush, Max Crumm, David Ian, Jim Jacobs, Derek Keeling, Kathleen Marshall, Austin Miller, Jonas Neal, Denise Van Outen, Chad Doreck, Laura Osnes, Kathleen E. Monteleone, Ashley Anderson, Jason Celaya, Kevin Greene, Matt Nolan, Ashley Spence, Juliana Hansen, Reed Prescott, Kate Rockwell, Allie Schulz, Tiffany Ellen Solano, Bruce Eckstut, and Mary O’Rourke. A reality show in which contestants compete for the lead roles of Danny Zuko and Sandy Dumbrowski in a new Broadway revival of the musical Grease! Weekly performances are judged by Tony Award winning director/choreographer Kathleen Marshall, Grease co-writer Jim Jacobs, and British producer David Ian. 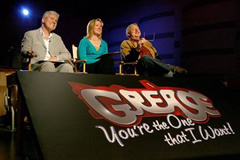 The viewers however determine who goes home and who moves on to the next round of the competition. The show is hosted by Billy Bush and Denise van Outen. More about: Grease: You're the One That I Want! Grease: You’re the One That I Want: Was the NBC Reality Show Really a Failure?